Another month and we've got another Core i5 machine questing for the crown of the top sub-£1000 PC. 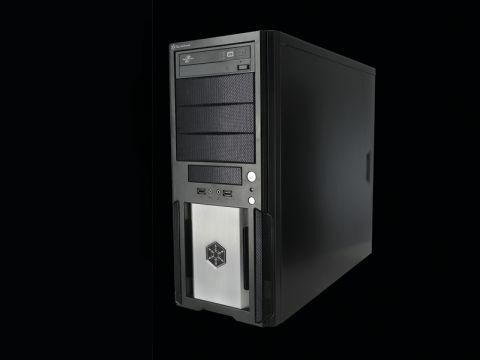 But in this YOYOTech Warbird i750 there is something different; thanks to the drought that's surrounded the launch of AMD's latest 5-series graphics cards this is actually the first full rig that's crossed our test benches sporting a DX11 GPU. This all came about because of an unreported fault at the TSMC factories, the people responsible for manufacturing the actual silicon make up at the heart of the AMD graphics cards. Up until now the 5-series has, to all intents and purposes, been purely a paper launch. Pretty much every e-tailer in the land has been out of stock of the latest graphics cards, meaning that anyone wanting a DX11 card to go along with their DX11 operating system has either had to have been on the pre-order list or has had quite a long wait. So the 5850 is the stand out part of this PC build then, but the now-gaming-standard of the Core i5-750 is also making a starring appearance here. We've seen a couple of other rigs offering the CPU with an impressive overclock, such as the systems we've seen from Scan and Advancetec, but this is the first that's come out of the box sporting a 4GHz clockspeed. Considering the chip's got a standard rating of 2.66GHz that's quite a boost. The chunky Coolermaster chip-chiller sitting on top of the CPU does have to work overtime when all four cores are loaded up, making a lot of extra noise, but in general use it's a decibel-friendly setup. After all, it's going to be quite rare that you'll actually be pushing the CPU to its limits since few games or apps are multi-threaded enough to max all four cores. Despite the extreme overclock though it's not going to melt a hole through your floor after a few hours of use. At idle it runs at around 38°C and tops out at 72°C under 100% load. One of the cores though ran significantly hotter than the rest and that topped out at just over 80°C. Still, that's short of the thermal cut-off point of the chip, but might need watching. The other thing to remember with this setup though is that it's shipping without an operating system. Because of the DX11 graphics you'll be wanting Windows 7, and with the 4GB of installed RAM you'll also be wanting to hit the 64-bit versions. Factoring all that in you're looking at close to £900 on a final price for a fully functional rig out of the box. But it's quick and that 5850 easily bests the GTX275 that's become the standard for sub- £1000 machines. We've seen a lot of machines floating around the £1000 mark and the Warbird i750 has knocked them all into a cocked hat. The lack of OS and no bundled screen does still make the original Achilles a tempting proposal, but this is the new king. The rest of the componentry happily supports the standout parts, though the 500GB HDD might seem a little miserly. But it'll take a while to fill that up anyway, and in the mean time you'll have clocked up many hours of satisfyingly hi-res, high-fidelity gaming.